Happy Leyendecker Baby New Year 2008! As I mentioned in my Happy Leyendecker Baby New Year! post from last year, master illustrator J.C. Leyendecker is responsible for initiating the tradition of representing the New Year visually as a baby. 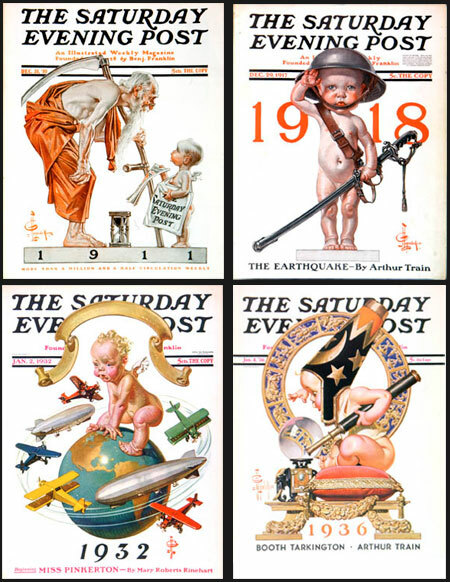 Here are a few more of his wonderful New Years babies from the cover of The Saturday Evening Post. Their archive is here and here. Israeli born illustrator and comics artist Asaf Hanuka studied illustration at Emile Cohl, an art institution in France. 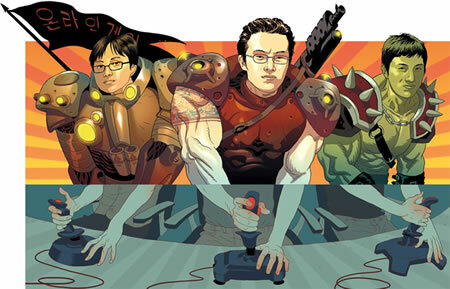 His illustration clients include The New York Times, The Wall Street Journal, Time, Rolling Stone and Forbes. His comics work includes collaborations with French writer Didier Desninckx on Carton Jaune! and Hors Limits, and Israeli writer Etgar Keret on Streets of Rage and Pizzaria Kamikaze, which was a 2007 Eisner Award nominee. Asaf also collaborated with his twin brother Tomer Hanuka on Bipolar. His illustration portfolio features a variety of his work, which can be stylized, straightforward or comically exaggerated. He employs the comic book art conventions of pen and ink line work filled with color, at times rendered and at other times graphically flat. Occasionally, he will even mix the two approaches in the same image as one of his techniques for controlling the focal point of the image. This is a factor that Hanuka seems to devote particular attention to, also employing tone, color and texture to make certain your eye is drawn to the exact spot in a given image where he wants it to go. The comics section of his portfolio includes covers and sample pages from several titles, both black and white and color. Unfortunately there are no sample pages from Pizzaria Kamakazi, but the pagess from Carton Janune look particularly interesting, with a textural approach tot the application of color the fits the setting. There is also a news section and a (not very informative) bio on the site. Asaf also shares the blog Tropical Toxic with his brother Tomer. Illustrator and comics artist Tomer Hanuka was born in Israel, where he attended an art-oriented high school and developed a fascination for American comic books. After his mandatory three years of military service, he moved to New York and studied illustration at the School of Visual Arts. He came out of school and right into illustration assignments and now has a client list that includes The New York Times, The New Yorker, Rolling Stone, Spin, MTV, Warner Brothers and Saatchi & Saatchi. He has garnered awards from The Society of Illustrators and the Society of Publication Designers. Tomer has also pursued his love of comics. He and his twin brother Asaf Hanuka self-published Bipolar in 2000. The series was then picked up by Alternative Comics, and has been nominated for the Eisner, Ignatz and Harvey awards. 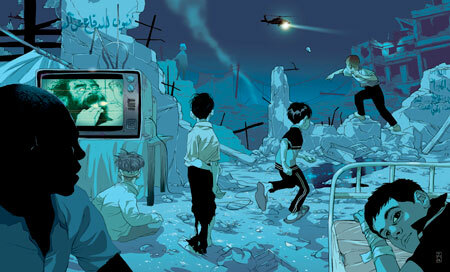 Tomer Hanuka has also been a regular contributor to the Meathaus comics anthology. He has also been working for DC Comics, notably on covers for The Un-Men. There is a collection of his short comics works called The Placebo Man. His web site opens with a horizontally scrolling selection of images, not as satisfying as a full portfolio, but I’ve found some other links for you and listed them below. There is also a blog that he shares with Asaf. Hanuka uses the line and color methods of comic book art in his illustration, filling his line work with emotionally expressive color. His drawing approach ranges from straightforward to stylized, and he often delves into the dramatically violent. His usual process is to draw in ink and brush on paper and apply color digitally. Tomer Hanuka is the subject of an article in the January 2008 issue of Juxtapoz. Louis Carrogis, who was known as Carmontelle, was an 18th Century French painter, architect and designer. He was active at a time when the French court was eager to ease the tedium of their endless dalliances and interpersonal intrigues with new “entertainments”. Carmontelle supplied an ingenious one in a form that may be thought of as a precursor to cinema, a moving image, illuminated from behind. As a result of his fascination with light and moving images and his skills as a painter and designer, Carmontelle was able to create a striking effect by painting a series of connected transparent watercolor and gouache paintings, on particularly transparent but strong paper, between 12 and 18″ high (30 – 45cm) and as long as 138 feet (42m). These depicted scenes like luxurious parks filled with beautifully dressed gentry. They would be rolled up and then set in a mechanism that would allow them to be scrolled across the opening of a boxlike cabinet that was illuminated from behind by sunlight (presumably in an otherwise darkened room). Carmontelle would display these moving images accompanied by musicians or his own narration. The effect must have been very TV-like, and particularly appealing when moving views of summer landscapes were displayed in the dead of Winter. Carmontelle’s device was apparently not popular enough, however, to attract investors, so it went by the wayside after a while. Fewer than a dozen of his transparencies survive. There is currently an exhibition at The Getty, which has one of his rouleaux transparents, (“rolled-up transparent drawings”) in its collection (image above, detail, with full scroll at bottom). The exhibit runs to June 16, 2008. The Getty has a page devoted to the exhibition that includes an animation of the scrolling image. The site also includes some other drawings and paintings by the artist, and I list some additional resources below. There are also articles on Carmontelle, the transparencies and the Getty exhibition from the New York Times and the International Herald Tribune. 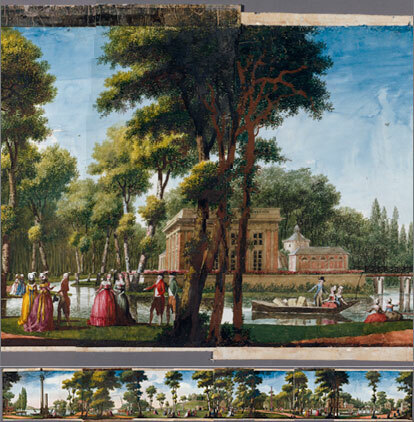 The Getty has published a book to accompany the exhibition, Carmontelle’s Landscape Transparencies: Cinema of the Enlightenment by Laurence Chatel de Brancion (more detail here). So get out your transparent watercolors and rolls of acetate and see what amusements you can come up with to fill in for the TV writer’s strike. Robert Tracy is a self-trained artist who works in a variety of media — oil, watercolor, acrylic, pencil and even silverpoint. He also tackles a variety of subject matter — portraits, figures, still life and landscape. Over the years he has developed an approach he calls “romantic realism’. Unfortunately, to see much of his work you must deal with some scattered resources. His main site has selections arranged by category, though limited in number, perhaps 5 or ten in each category. Tracy has also just produced a book of his work through Blurb (more on Blurb in a future post), and one of his sites is now devoted to the book, with previews arranged as Drawings, Paintings and Military Art, though the selections are also limited here to just a few in each category. Tracy is a Marine Corps veteran with two tours of duty in Vietnam, and a number of his works are of soldiers and military subjects from the point of view of a soldier, not the romanticized “military art” of video games and films. The most extensive presence for his work is his gallery on deviantART. I’m not the biggest fan of the deviantART interface, and the work here seems to be arranged without categories, leaving a scattered arrangement of work from different times, of a variety of subjects, in various degrees of finish and from differing levels of learning and accomplishment. He seems to have little concern for putting his “best foot forward” or editing the content. An early rough sketch might be next to a recent finished work, giving a rather splintered impression of his work. I might suggest jumping several pages in and looking around. There are over 400 works posted, so finding the best pieces can take some digging. 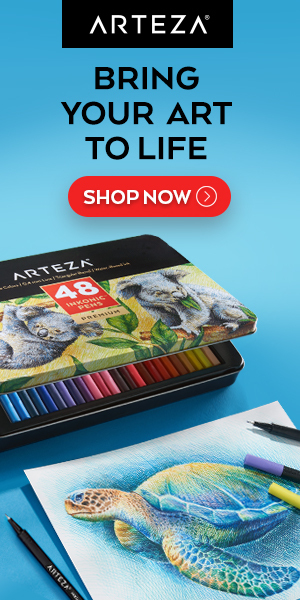 You will find some sensitive, accomplished watercolor portraits of family members and friends, landscapes and still lifes in a variety of media, as well as more concept oriented pieces and studies from the masters. Tracy indicates that he arranged his self-training around studying works of the masters. 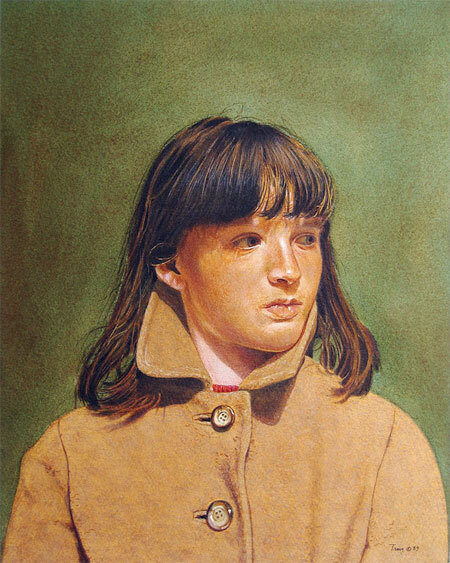 The image above, “That Look”, is in drybrush watercolor portrait (possibly of a family member, I’m not certain). The original post is here, click on the image for the larger version. Tracy also maintains a blog called Illustrated Ideas. Unfortunately a recent change of some kind, blog design, ISP, blogging platform or all of the above, has apparently set the blog back to zero as of this month, with no access to the extensive archives that used to be available. Hopefully this can be rectified, as there were a number of interesting posts that would be nice to have back out on the new blog. Illustrated Ideas isn’t specifically an art blog, though that has been a strong component in the past. The masthead reads “Art, Military, Politics, Religion”, topics that are likely to rouse strong opinions, of which Tracy isn’t shy. 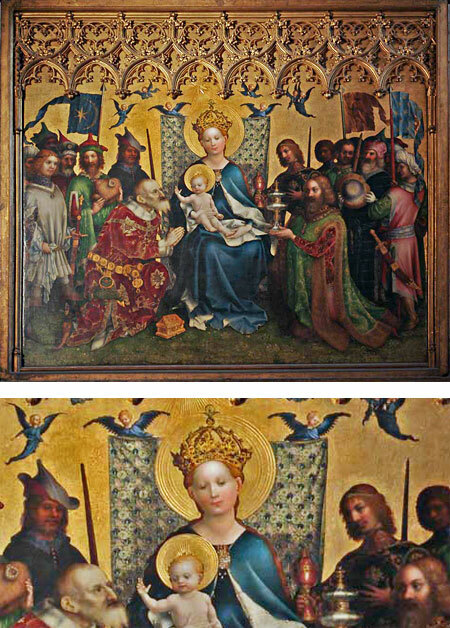 At over 8 ft by 6 ft (260cm x 185cm), this central panel of a triptych for the Altarpiece for the Saints of Cologne presented viewers with an almost life size tableau of the classic Biblical scene (large version here). It was painted in the 1440’s by the late Gothic German painter Stefan Lochner, also known as Stephan Lochner or Stephen Lochner. Lochner combines the German Gothic style with influences from the Flemish painters of his time, presenting a scene with strong naturalistic elements, brilliant colors and intense focus on detail. The kings and attendant figures are all dressed in modern (for the time) clothing, rendered with great attention to the nature of the rich fabrics, along with the detailed armor of the knights and the intricate decoration of the gifts. Lochner also devotes attention to the individual likenesses of the supporting cast (presumably of the town’s elders and wealthy). The angels are also unusual in that they are “bodiless”, their blonde heads and childlike arms depicted as solid, but their remaining figures mere wisps of suggested motion. Lochner may have absorbed influences from elsewhere; scholars suggest that his command of perspective in some images was far enough ahead of his contemporaries in Germany that he must have been exposed to the new developments in perspective that were coming out of Italy at the time. In his Adoration, however, we are still given a scene that is on that edge where decorative devotional art meets naturalistic rendering, to remarkable effect. Lochner intended that we, like the Magi, be stunned by the beauty of the moment.